Every update that goes by I’m thinking “Where are the new characters?” I thought this Smash Bros. was going to have the most characters out of all the Smash Bros. games. 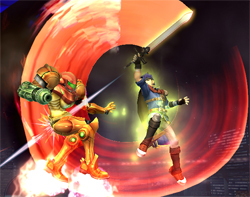 I’m honestly getting scared that Captain Falcon isn’t going to be in Brawl, which would not be cool. And where is the Square character? Previous Previous post: Get Mass Effect Early!